A pastor known for performing controversial miracles has allegedly been killed by his own cobra while performing miracles. The controversial South African Prophet who made his followers eat snakes in his church saying that he had turned them into a chocolate just like Jesus did with water and wine in the bible is now reportedly dead after being bitten by a cobra he was using for another round of miracles in his Ministry. The South African prophet rose to international fame in just weeks after he rode his congregants like donkeys, made them strip n*ked in church, eat braids, paper, rocks, and dirt. He shocked the entire world when he brought live snakes to a service, and declared that those who believed in the power of Jesus and had faith could eat the venomous snakes and God would turn them to chocolate. Congregants who munched on the animals confirmed that the snakes indeed tasted like chocolate to them. 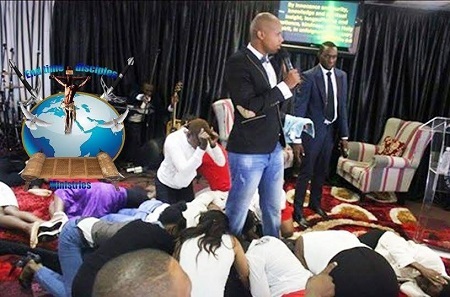 The prophet quickly became known as the ‘Snake Pastor’ in South Africa, where gained notoriety alongside popularity. In no time however, he found himself in huge trouble with the law. The South African Society for Prevention of Cruelty and Protection to Animals (SPCA) laid criminal charges against him for cruelty to animals. They argued that the manner in which the animals were killed as cruel, and painful. Eating of animals alive is considered criminal in South Africa. The Association that controls churches in South Africa quickly deregistered his church for malpractice, and they ordered him to report to a disciplinary hearing. The prophet however refused to attend, forcing the association to consider having court order mandate him to attend. Political activists from the Economic Freedom Fighters then stormed his church and destroyed his tent, and several other material. However that move solicited a strong response backing the prophet, as freedom of religion is protected in the constitution of South Africa. The EFF responded by claiming it was rogue youths with no association to the party who had orchestrated the damage. However the latest development will bring shock waves to the country. South African Tabloid, iMzansi reported that the ‘Snake Pastor’ had died. According to the publication, Soshanguve Police revealed that on Tuesday night, Penuel Mnguni, 24, of the End Times Disciples Ministries in Soshanguve was handling a snake during a Sunday service at a Pentecostal church in Jenson. Unnamed authorities said Prophet Mnguni was bitten on his left arm and refused medical treatment thereafter. Reports are that Mnguni went to his brother’s home, where he later died. The local coroner pronounced him dead. Members of the church declined comment but reports are that there will be no funeral as the they believe he will resurrect. The Prophet’s gathering is now synonymous with despicable. A few days ago, a lady Bishop in the church walked up to the Pastor who was preaching, and grabbed his reproductive organs during live service. Previous NEW MUSIC- @Laylizzy ft aka ” Hello” #HelloLaylizzy. Next UPDATE- PROPHET ASCENDS TO HEAVEN ON EASTER DAY, SNAPS PICTURES OF HEAVEN…LOL!! !